This weekend is going to be a very exciting one for me! 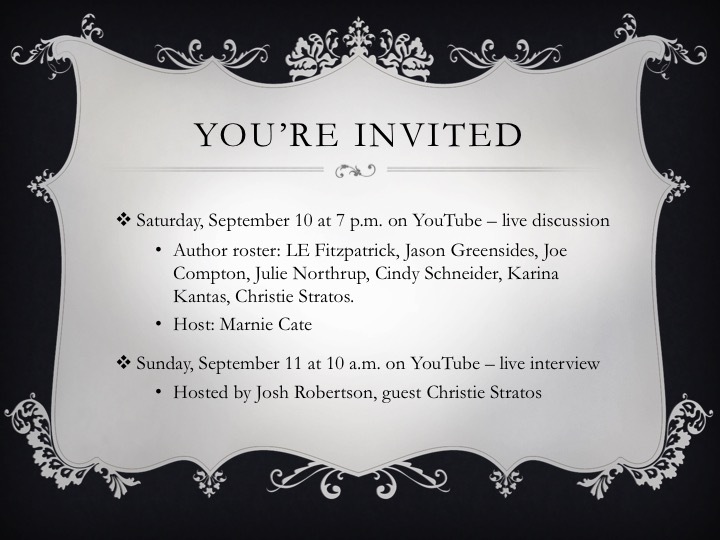 Author Event #1: Saturday, September 10 at 7 p.m. EST, join legendary indie authors and me for a live discussion of all things writing. The author roster includes LE Fitzpatrick, Jason Greensides, Joe Compton, Julie Northrup, Cindy Schneider, Karina Kantas, and me, with host Marnie Cate. Click this link to watch! Author Event #2: Sunday, September 11 at 10 a.m. EST, I’ll be interviewed by Josh Robertson, who is a prolific writer and matchless multitasker. We’ll talk about reading, writing, and anything that comes up. I hope to see you at either (or better yet both) events! This entry was posted in Authors, Events, My Book News and tagged anatomy of a darkened heart, author, author event, authors, book event, Christie Stratos, christie stratos events, fiction, go indie now live, historical fiction, interview with joshua robertson, live discussion panel, live interview, weekend events, writer, writers, writing, youtube live discussion.